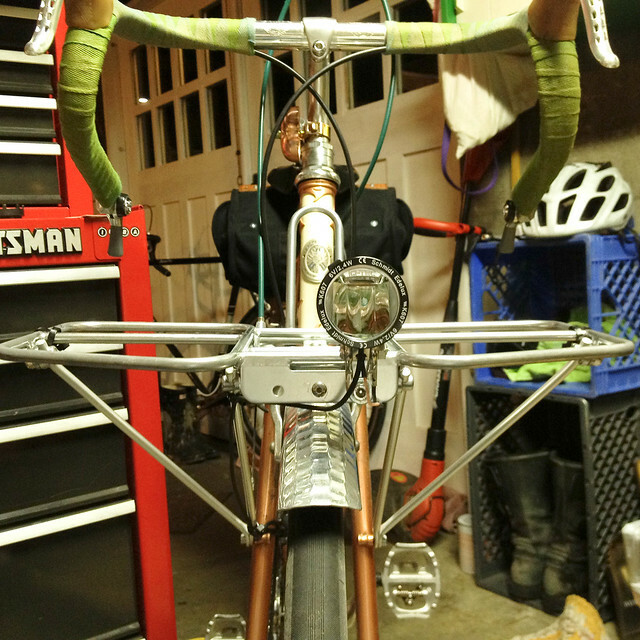 This is a picture of how I had originally mounted my front Rivendell/Nitto PlatRack on my bike. I have always liked having the larger platform of the Platrack on my AHH, but disliked the long struts that stretch down to the fender mounts by the axle. I had removed the rack for the rando season a few months back, but have wanted to put it back on a few times, because it is so handy to have the extra load surface when commuting. I have had an idea to do an alternate strut configuration rolling around in my head for the past few months, and finally decided to take action. 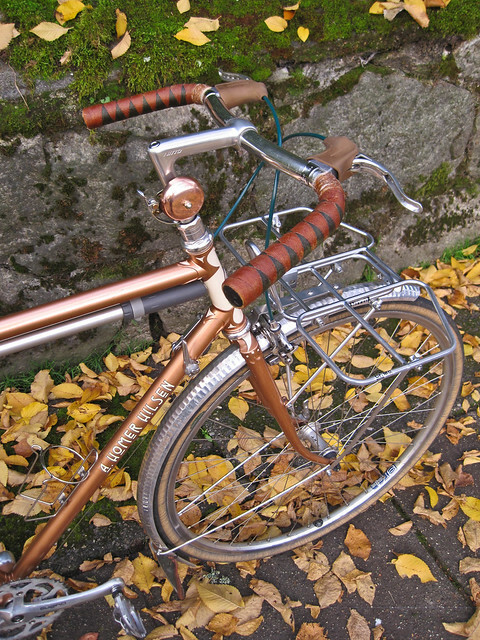 After watching one of the Rivendell videos on mounting a rear rack where they bend the struts with a couple of good hammer whacks, I was inspired. 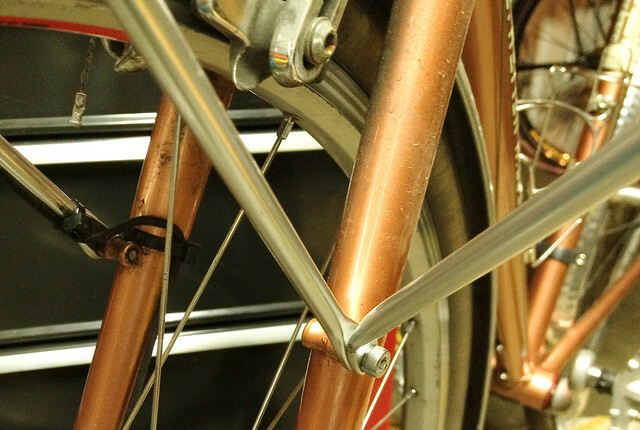 I bent and shortened the long struts to join at the mid fork braze-on where the other struts from the Mark’s Rack join. It is likely “not quite” as strong, and I’m sure it’s a warranty voider in Grant and Nitto’s eyes, but I don’t carry much more than 10 lbs on the front. In any case, it feels solid as a rock to me. Because of the imperfect hammer-bending technique I employed, I found that the fender line needed a bit of work after the first mount try. I loosened up the strut screws where they met the Marks and Plat Racks, and try to cold bend it into the proper position to get better alignment and keep the whole assembly as non-stressed as I could make it. I also took the opportunity to move the Edelux light to the hole that was off-center. This will move it out of the line of spray if I’m in rain and there is water coming off the front of the tire. I’ve now ridden with this setup on numerous commutes and a 20 miler. I also removed the saddlebag and went with just a front rando bag with the tools consolidated. My Acorn is stable and rides on the rack well, even though it is a smaller footprint. The bike has been stable for no-handed riding, and with less weight on the saddle, it seems to have less speed wobble with this setup. 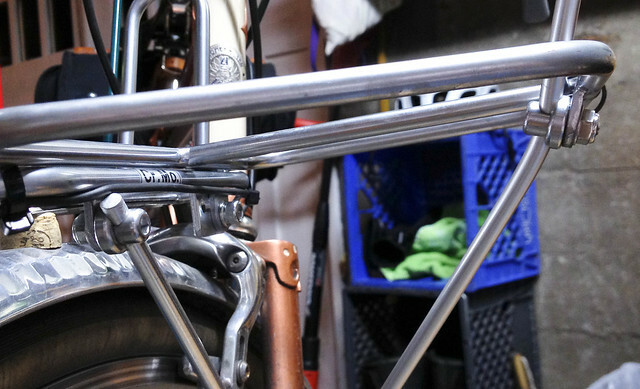 I also feel like I get more active suspension from this setup, as it leaves the front fork’s lower half free of additional struts. If you have thought about trying something like this, I would encourage it. It was a simple procedure that just required a mallet, hacksaw (for trimming the longer strut down to size), and some patience. I basically eyeballed the bend on one side, and tried to do the second strut in the same angles. It took a total of an hour or so to get what I wanted.